Welcome back to AFL tipping all you diehard and new tipsters in what promises to be yet another bumper year in Ugly Bustards Footy Tipping. The Joker Ladder with full card bonus, five joker rounds and away teams on missed tips is on again with the Prize Pool & Ugly Bustards merchandise spread among the top 3 paid-up tipsters. Weekly Prize jackpot of $5 continues for paid-up tipsters (depending on prize pool entries). Prize Pool entry deadline is delayed a month to 30th May due to the late start to the season. 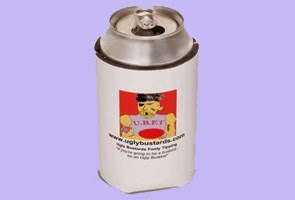 Email uglybustard@uglybustards.com for details on how to enter. Entry fee is again just $20, but for an extra $10 you receive an Uglybustards Stubby Holder and you'll be supporting diabetes research via a $5 donation to the Juvenile Diabetes Research Foundation. For those who are good or lucky enough, $5k 1st, $3k 2nd, $1k 3rd and a share in $250k cash giveaways on the footytips.com.au site if you get your tips in each week. 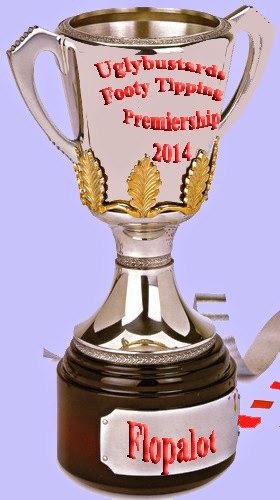 Flopalot 2014 Uglybustards Premiership Titleholder.